The first maiden claimer of the meeting for juveniles kicks off the Sunday nine-race program. #4 Crosscheck Carlos looked good breezing a furlong in 10 1/5 seconds at the OBS March sale and then brought a respectable $37,000 at auction. The Doug O’Neill-trained colt is bred to win early, lands top rider Flavien Prat, and tuned up with a 34 3/5 seconds gate blowout at Los Alamitos just four days ago. #2 Zen Deputy is bred for extreme speed (Zensational), hails from a barn that boasts good stats with first-time starters, and has shown enough talent in the a.m. to warrant a strong look at this level. We’ll use both in our rolling exotics while preferring Crosscheck Carlos on top. The second race is a starter’s allowance abbreviated sprint for $8,000 older horses and finds #1 May B listed as the 4/5 morning line favorite. A winner of his last three starts, including a more than nine length romp at Los Alamitos last month with a career top speed figure in his first start since October, the Mark Glatt-trained gelding retains Edwin Maldonado and will dominate this group with anything close to his best. He’ll be too short on the tote to consider in the straight pool but we can use him as no-value rolling exotic single. The third race is a restricted (nw-2) $12,500 claiming sprint for fillies and mares and offers another short priced, no value favorite, #2 Sparkling Peg. She’ll be heavy chalk by default; there just isn’t anything else in here that figures to take any money. Third in her last pair and retaining Martin Pedroza, the daughter of Fusaichi Pegasus has back numbers that if repeated will dominate this modest band, but she’s hardly the type to trust. Use her as a rolling exotic single if you’d like, but best advice is simply to pass the race. Second-level allowance turf milers meet in the fourth race, a stronger-than-par event that brings out the recent impressive U.S. debut winner #2 Ebadan and the highly-regarded Brazilian import #6 Ohio. Ebadan produced an exciting turn of foot to win a Hillside turf sprint last month at 12-1 in his first start since winning a maiden all-weather invent in Ireland in January; the Neil Drysdale-trained gelding earned a strong speed figure in doing so and proved overseas that he can handled today’s extra distance. Prat stays aboard. Ohio was eased over a wet-fast track he simply couldn’t handle in the American S.-G3 last month – a race you can toss out – but his previous score over this course and distance was highly impressive and makes him a strong threat to bounce back with his best effort today. Though the Paulo Lobo-trained horse has won using gate-to-wire tactics he’ll probably settle into a stalking spot today. We’ll give Ohio a very slight edge on top but it’s a close call and either one can win. The fifth race is a fairly competitive starter’s allowance middle distance main track event for fillies and mares that have raced for $16,000 in the past two years. #1 Seeking Shamrocks just qualified for the race, having won for that price in a highly-rated extended sprint here last month, and while she’s unproven at this distance she could be tough to catch in her present form. #4 Take It Easyplease won a state-bred allowance event at Los Alamitos in April and can be counted on for another good effort with Rafael Bejarano staying aboard for Richard Baltas. 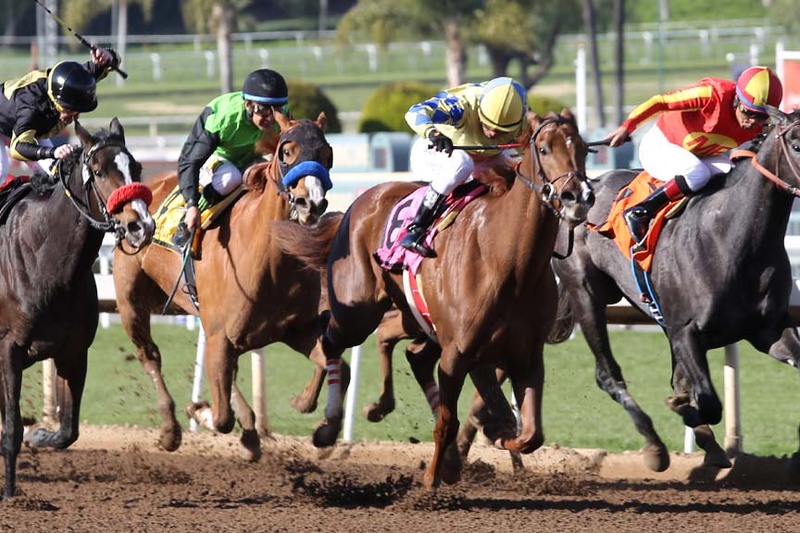 She’s won over the Santa Anita main track in the past, employs a good pace-stalking style, and shows a steady, healthy recent work tab at San Luis Rey Downs to remain on edge. #5 Light Striker usually gets a piece of it and could be a strong late threat if the pace comes up a bit faster than par. Let’s use all three in our rolling exotics while slightly preferring Seeking Shamrocks on top. Restricted (nw-3) $32,000 claimers meet over a mile on turf in the sixth race, the first leg of the late Pick-4. #6 Street Moxie is a first-off-the-claim play for trainer Phil D’Amato and makes his California debut after finishing a solid runner-up at this level at Keeneland in his most recent outing in April. The local work tab is steady, go-to rider Tyler Baze takes the call, and the gelded son of Street Sense seems well-placed for a major effort for his high percentage connections. #5 Anthonysgotgame beat a softer field in good style with a nice speed figure sprinting last month, moves up a level, stretches out, and tries grass for the first time. Lightly-raced, improving and certainly bred for the lawn (Henrythenavigator), the Paul Aguirre-trained gelding is a “must use” in the exotics. We’ll also toss in #4 Los Gatos, a class dropper in the Carla Gaines barn. Both of his career wins have come over this turf course, he’s a fit on speed figures, and he should help insure a decent pace. #2 Kiss at Midnight was a beaten favorite when a disappointing fifth in a similar one mile turf event last month but seems capable of bouncing back in today’s seventh race, an entry-level allowance event for fillies and mares. She switches to Prat, lands a comfortable inside post, and should be able to produce the last run. However, she doesn’t really offer much value at 9/5 on the morning line. #8 Minister’sadventure beat a state-bred field in clever style on the main track recently out but is just as effective on grass, and looms the one to fear most. She can win pressing the pace or settling in mid-pack, so we anticipate jockey Martin Garcia will size up the race flow from his outside draw before committing to a strategy. The Jerry Hollendorfer-trained filly has numbers that continue to rise, so another forward move is likely. Fillies and mares get the rare chance to compete over the marathon distance of a mile and one-half in the eighth race and both #3 Evo Campo and #6 Sharla Rae should take full advantage of the opportunity. The Irish-bred Evo Campo looked good winning a second-level allowance race over this course at nine furlongs last month, rallying smartly into the teeth of slow splits to be up in time. She has the makings of a very good long distance performer for trainer Paddy Gallagher. Sharla Rae, the winner of the Del Mar Oaks-G1 last year, was a bit rusty when sixth, beaten four lengths, in the Royal Heroine S.-G2 in her recent comeback but won’t be today, especially against this considerably easier company. She’s winless in five starts over this particular turf course, but four of those races came in graded company, so we won’t hold that record against her. Let’s go with Evo Campo slightly on top – she might be a bit better price – but use both in rolling exotic play. The finale is a maiden claiming $20,000 main track mile event for fillies and mares. #8 Goldrushcat, second in her last pair, most recently by a half-length while more than four clear of the rest, is overdue for a win and should be favored to finally graduate with Bejarano staying aboard for Glatt. She blew a clear lead in mid-stretch in both of those runner-up efforts, but against this group she could easily stick it out. #5 Basie Boots is steadily improving with racing and with another forward move figures right there. She’s dropping 10 pounds with the switch to bug boy Lindsay and is stretching out for the first time. We’ll use both in our rolling exotics.